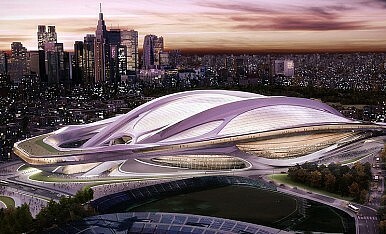 While the final decision has yet to be made about which city will host the 2020 Olympic bid, Tokyo’s chances look good. If Japan’s capital seals the deal, much of the infrastructure is already in place thanks to the fact that the city hosted the 1964 Olympics. Paramount among the complexes and groundwork put in place almost 50 years ago is Kasumigaoka National Stadium, once Tokyo’s athletic jewel in the crown. In the hope of clinching the bid for 2020, Tokyo’s National Stadium is set to receive a monumental makeover by British architecture firm, Zaha Hadid Architects. The ultramodern complex is set for completion in time for the 2019 Rugby World Cup, which Japan will host. The architect’s vision for the revamped 80,000-seat stadium with retractable roof looks like a cross between a gigantic bicycle helmet and an alien spacecraft. Yet, it somehow visually manages to fit into the surrounding area. Urban Japan is often likened to the cityscapes of Blade Runner after all. “The design is both light and cohesive, seamlessly connecting the stadium’s different elements to create a silhouette that integrates with the city,” Hadid said. Images of the colossal egg-shaped structure can be seen here. The current National Stadium to be replaced can be seen here. Getting to this point was no simple feat for Hadid, whose entry was chosen from 46 initial bids. The contest for the project was overseen by renowned Japanese architect Tadao Ando. Alongside being able to seat at least 80,000 and sporting a retractable roof, the contest called on entrants to factor in environmental efficiency, ensuring that the design meshes with the surrounding area (including transportation logistics) and the guarantee that it can be completed by March 2019. Candidates were also required to present some serious credentials, having won at least one of the following architecture prizes: the Pritzker (won by Toyo Ito this year and Hadid in 2004), the Praemium Imperial Honor of Prince Takamatsu or a gold medal from either the America Institute of Architects, the Royal Institute of British Architects or the Union Internationale des Architects. Australia’s Alastair Ray Richardson (Cox Architecture) was runner-up in the contest, while Japan’s Kazuyo Sejima from SANAA+Nikken Sekkei finished third. Another intriguing bid came jointly from Parisian firms MenoMenoPiu Architects and FHF Architectes, which offered up their elliptical-spiraled vision of The Twist. As winner, Hadid collects a handsome 20 million yen, while the Japan Sport Council has set the project’s budget at 130 billion yen.